Log in or Register to download files. Short summary of Ticket to Ride rules in Ukrainian. Intended for a quick reminder. Короткі правила Ticket to Ride українською. Призначені для швидкого нагадування. Here it's an traduction and increase version of Paul Cunningham with 107 different caractere with power for put more fun in our ticket to ride's game. You can play with all map and don't need any special extansion. This link contain 12 set of people + back card + french rule and description for all caractere. Enjoy it. All Ticket to Ride maps (base game through 2018), stuff I end up referencing when playing other maps. Includes Alvin & Dexter. Check out my other player aids & tuckboxes too! All Ticket to Ride maps (base game through 2018), stuff I end up referencing when playing other maps. All Ticket to Ride maps (base game through 2017). PLEASE USE V5, misc errors and omissions have amended. Old file is here for archiving purposes. Rute cards for the TTR México map. It includes a blank template for making your own. Tarjetas de rutas para el mapa TTR México. Incluye plantilla en blanco para agregar la que gusten. High quality map of "Ticket to Ride México", unofficial user-created map, based on the original game. Mapa en alta calidad de una versión no oficial de "Ticket to Ride México", basada en la cantidad de rutas y ciudades del juego. The pdf file contains a pair of tuckboxes designed to hold the mini cards that come with Ticket to Ride USA. I designed the tuckboxes to store the cards in landscape orientation. For each tuckbox, you'll need a sheet of card stock in US Letter or A4 size. I used 110 lb card stock for these. When printing, make sure to turn scaling off and enable print centering. In general, fold along the dotted lines and cut along solid lines. Using a bone folder on the dotted lines prior to cutting makes folding them later a breeze. Glue should be applied to the solid white tabs when you're ready to finalize the assembly. The tuckboxes were made in GIMP using blutdi09's tuckbox template script. 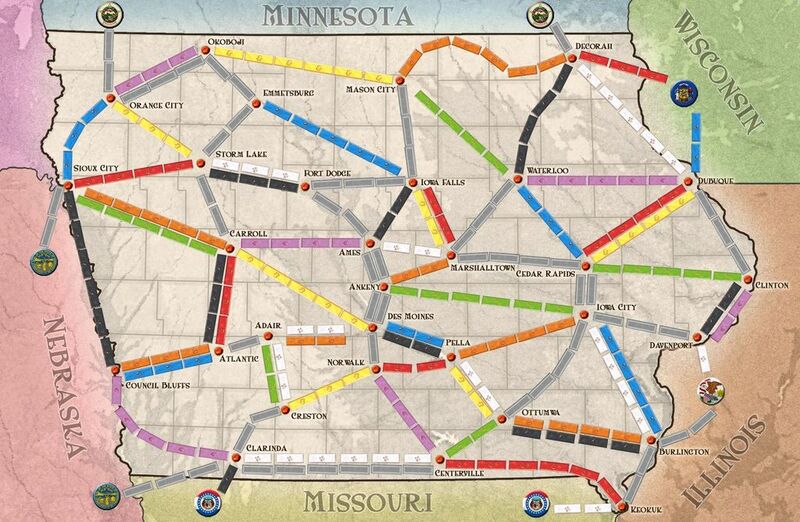 Ticket to Ride: Iowa - Unofficial user-created map for the state of Iowa based on the US and Switzerland maps. 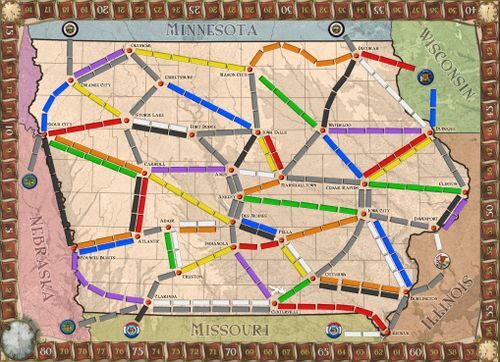 Ticket to Ride: Iowa - Unofficial user-created map for the state of Iowa based on the US and Switzerland maps. Includes map divided into 8 printable sections and 4 pages of destination tickets (64 tickets). For full map, check images section. Includes missions from state to state and city to state. This is a quick rules guide for Ticket to Ride USA, plus Europe, Marklin, Nordic Countries, Asia, Legendary Asia, Switzerland, India, Africa, Nederland, Pennsylvania, United Kingdom, France and the Old West. This also includes the 1910, 1912 and Alvin & Dexter expansions. Print front/back for all of this to fit on only 4 pieces of paper! A Dutch short summary of all the ticket to ride expansions that I have. Missing one? Let me know! Een korte Nederlandse samenvatting van de uitbereidingen van Ticket to Ride. Dit zijn de uitbereidingen die ik heb of wil hebben. Mis je er een? Laat het mij weten! Characters is an expansion for Ticket To Ride. Set 12 contains an icon reference card, 5 characters suitable for use with Ticket to Ride: The Card Game, 2 characters suitable for use with Ticket to Ride: The Dice Expansion, and 1 character suitable for all Ticket To Ride games. Characters is an expansion for Ticket To Ride. Set 11 contains 6 characters suitable for use with Marklin and/or Deutschland maps, 1 character suitable for use with Rails & Sails maps, and 2 characters suitable for all Ticket To Ride games. Characters is an expansion for Ticket To Ride. Set 10 contains 5 characters suitable for use with France and/or Old West maps and 4 characters suitable for all Ticket To Ride games. Update 17-09. Characters is an expansion for Ticket To Ride. Set 9 contains an instruction card, 3 characters suitable for use with Marklin and/or Deutschland maps, and 5 characters suitable for all Ticket To Ride games. Update 17-09. Characters is an expansion for Ticket To Ride. 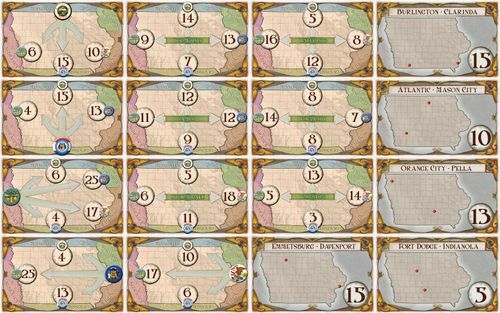 Set 8 contains 2 characters suitable for use with Alvin & Dexter, 2 characters suitable for use on the India map, 1 character suitable for use on the Africa map, 1 character suitable for use on the Pennsylvania map, 1 character suitable for use on any map with ferry routes, and 2 characters suitable for all Ticket To Ride games. Update 17-09. Characters is an expansion for Ticket To Ride. Set 7 contains an instruction card, 3 characters suitable for Rails & Sails maps, 1 character suitable for Rails & Sails and/or Old West maps, 2 characters suitable for Legendary Asia, 1 character suitable for team play, and 1 character suitable for all Ticket To Ride games. Update 17-09. Characters is an expansion for Ticket To Ride. Set 6 contains an instruction card; icon reference card; 6 characters suitable for Nederlands, Nordic, and/or Switzerland maps; and 1 character suitable for all Ticket To Ride games. Update 17-09. Characters is an expansion for Ticket To Ride. Set 5 contains an instruction card, icon reference card, and 7 characters suitable for Ticket To Ride: Europe and Europa 1912 games. Update 17-09. Characters is an expansion for Ticket To Ride. Set 4 contains 9 characters suitable for all Ticket To Ride games. Update 17-09. Characters is an expansion for Ticket To Ride. Set 3 contains 9 characters suitable for all Ticket To Ride games. Update 17-09. Characters is an expansion for Ticket To Ride. Set 2 contains 9 characters suitable for all Ticket To Ride games. Update 17-09. Characters is an expansion for Ticket To Ride. Set 1 contains 8 characters suitable for all Ticket To Ride games. Update 17-09. Characters is an expansion for Ticket To Ride. This file contains optional card backs you can use when printing your Characters deck. Includes all maps up to Ticket Ride France & Ticket to Ride Old West! As always, an effort was made to minimize errors, but should some still remain, please point them out. This document is not intended to replace the various TTR rule books but rather to summarize the differences between all the TTR maps. Every board (up to Rails and Sails, and including Zug um Zug Deutschland) is included in this chart. Please leave your comments below, and should any errors remain, please flag them below. Para los que de forma rápida quieran saber cuantas cartas se toman, cuantas se descartan, los bonus finales, y las características generales de cada juego de la saga, les traigo una guía rápida en español. The Variants Deck is an expansion for all Ticket to Ride games. Instructions: Shuffle the deck of Variant cards and flip one variant card face-up to determine which special rules and restrictions will be used in the game. Plays with one copy of standard TTR, all you need is the trains. Use custom board and destination cards. Als het een lange tijd geleden is, kan deze samenvattingskaart je helpen bij het spelen van Ticket to Ride (+ alle maps). Zo moet je niet hele tijd grijpen naar de spelregels! Added the United Kingdom/Pennsylvania expansion. Made some corrections. The file includes english and swedish summaries. If you want to make a translation into your own language just copy a sheet and use it as a base. Made some corrections. The file includes english and swedish summaries. If you want to make a contribution with another language feel fre to mail me. Added Netherlands to the sheet. I also made some visual improvments after feedback from Nathalie (MelodramaBabs). Thank you Nathalie! Corrected the "Globetrotter" (most tickets) card in the US 1910 expansion to 15 points according to the rules. Feel free to use this Excel document that summarises all the expansions. Print it and laminate it. The document contains two tabs, one english and one swedish. You can copy a tab and translate the text to your own language. You can also expand it if you feel something is missing. I use this summary when we play best of 7 games with different maps! Added the United Kingdom / Pennsylvania expansion. Corrected also some errors. Added Netherlands to the sheet. I also changed the game from best of 7 to best of 9 games. Feel free to use this excel document. It contains the rules we use when we play Ticket to Ride best of seven games. It also contains a score pad for the duel. 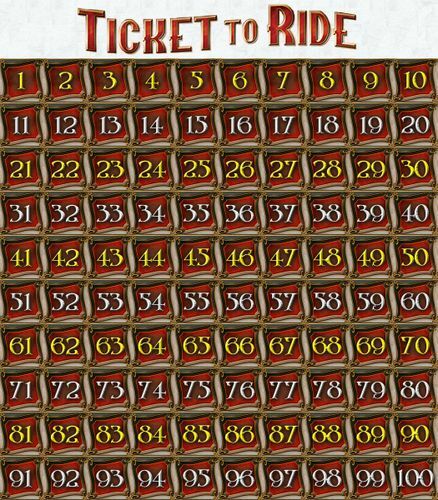 A set of two-sided "cheat cards" with the set-specific details for each version of Ticket To Ride up to and including Unitked Kingdom/Pennsylvania. They are sized to match TTR cards (other than the original-set small cards), and designed to be used as front-and-back cards to enable rubber-band binding without risk of card damage or staining. Directions: Fold on the middle line and glue to produce two-sided cards, or cut each separately to produce one-sided cards (which may be double-tucked into a sleeve to create a two-sided card without gluing). Replaces earlier "1910/1912 Versions Cheat Cards" file, adding more recent expansions. Różnice w zasadach gry pudełek z rodziny Ticket to Ride. Rules comparison of Ticket to Ride games - in Polish. Rules comparison of Ticket to Ride games. Summary of the rules differences between the games of TtR family.